CEDAR CITY – Abraham Lincoln made Thanksgiving an official holiday 153 years ago in 1863, and since then, families across the country have celebrated with large family gatherings and dinners customarily consisting of turkey, mashed potatoes and stuffing. The traditional Thanksgiving dinner is thought to have derived from the first celebration of this type in America when the English colonists, today called Pilgrims, shared a harvest feast in the fall of 1621 with the Wampanoag Indian tribe. At the time, historical journals show there were about 50 settlers and 90 Native Americans, said Chad Reid, professor for Utah State University Extension Office in Cedar City. The colony’s Native American allies had helped the Pilgrims learn to cultivate corn, extract sap from maple trees and catch fish in the rivers thus the reason the two groups enjoyed the celebratory feast together. However, what isn’t known for sure is what was on the menu 395 years ago. Journal entries show the settlers ate “beef and fowl,” but whether that meant turkey is unknown. 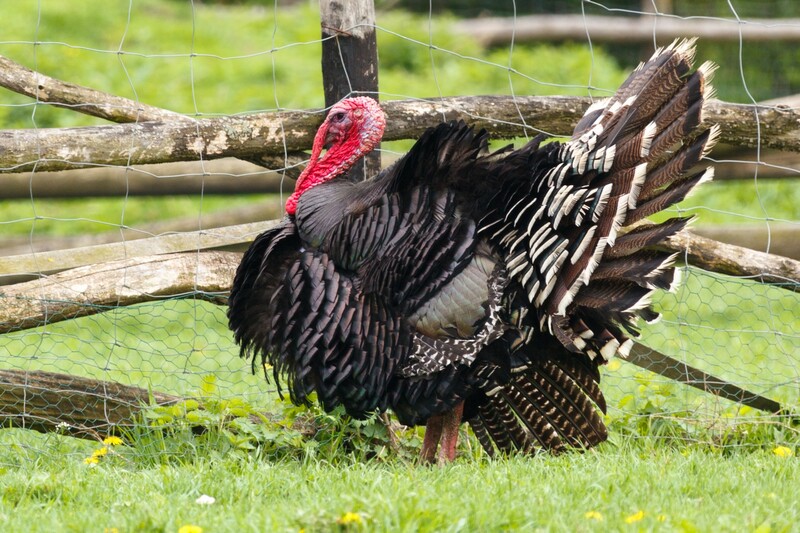 The turkey is unique to North America, making it very likely the settlers did have it at their dinner table that first Thanksgiving, Reid added. While the bird has long since become a symbol of American tradition and many families still enjoy it, the customary Thanksgiving meal isn’t for everyone. Some families have opted to get away from the time-honored tradition by shaking up their menu with different types of meats, while others have chosen to alternate the turkey dinner with different types of meals. There are also those who would prefer to just throw out the entire custom of spending the day in a hot kitchen and instead use the time they save from cooking to spend with family and friends. Cedar City resident Stephani Reid and her family decided a long time ago that rather than continue to chow down on turkey every year, they would substitute it with a family member’s favorite meal. Each year, everyone writes down a meal they would like to have cooked that is later chosen out of a hat. Through the years the list has consisted of a variety of foods – everything from breakfast fare to rib roast cooked just like Martha Stewart, Reid said. “We do it every year, but we agreed a long time ago on this that we will eat whatever meal is pulled out of the hat,” she said. However, the Reid family does have a favorite dish among them they cook every Thanksgiving dinner, no matter what other type of food they have: spoon bread with homemade apple butter. A classic in the South, Reid said she learned to cook it when she lived in Gettysburg, Pennsylvania. “It’s one of our favorite dishes, and it has to be on the table every Thanksgiving. We don’t eat unless the spoon bread is on the table,” Reid said. For Dan Houchen’s family, Mexican food is a favorite at Thanksgiving. Every other year, Mexican food is cooked at the Houchen’s; on the off years, they enjoy a traditional dinner. The tradition started about 10 years ago, Houchen said. It was then the family decided they wanted something different, and since Houchen’s mom is Mexican, they figured they would honor their heritage by trading rice for mashed potatoes and swapping tamales for turkey. Houchen, who is from Cedar City, said his favorite meal at Thanksgiving is the tamales and enchiladas his mom makes. In Iron County, where many families come from sheep ranchers, the choice of the main food at Thanksgiving is often a leg of lamb. This is the case for Jan McIntyre, whose family has raised sheep since the community was settled. “We decided about 10 years ago we would rather have a leg of lamb than dry old nasty turkey,” McIntyre said. McIntyre, who lives in Enoch, admits lamb is an acquired taste for people who haven’t grown up with it. Instead of lamb, Carin Batcho-Miller and her family enjoy duck this time of year. Miller also cooks a turkey but enjoys the delicacy of duck, which she prepares differently every year. Some people choose to get away from any semblance of the traditional meal, like Miller’s uncle, Danny Crow, who can’t eat hot dogs throughout the year for health reasons. On Thanksgiving, however, Miller said he forgets about any medical issues he may have and for that day enjoys his favorite food. Marshall Connelly has always eaten turkey, but this year he decided he’s going to add deer steak to the list of food choices on his mom’s dinner table. Connelly said he got the idea after he found out his mom’s new boyfriend has never eaten venison before, something that’s a favorite for him. Then there are those who say they have always enjoyed the traditional meal but this year, for various reasons, thought about doing something different. Cassie Meredith told her family that if everyone was coming to her home to enjoy the holiday they’d be eating pizza instead of turkey – and she meant it. A working mom and wife, Meredith said she wanted to enjoy the holiday this year with her loved ones and felt that ordering pizza would free her up to have more time with her family rather than having to worry about the cooking and the cleaning that comes beforehand with a big turkey dinner. 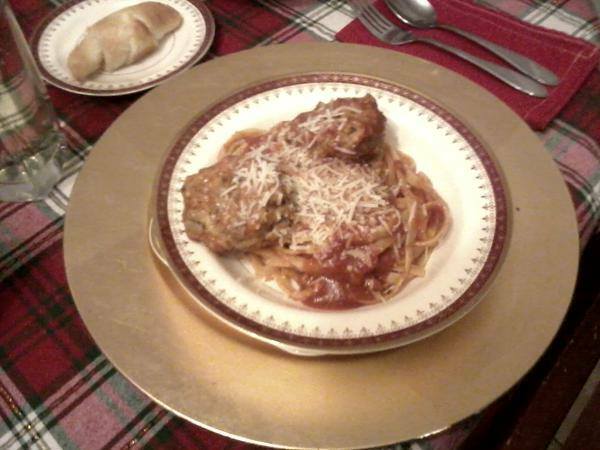 Meredith said she doesn’t feel anything is lost by making dinner as easy as possible. This won’t be an issue for Meredith this year, however, as she will be enjoying Thanksgiving dinner at her family’s home where they will be eating the traditional turkey and stuffing. Maybe next year she’ll get the chance to order pizza, she said. While many families opt for a nontraditional Thanksgiving meal, others still cook the turkey and all the fixins that go with it. According to McIntyre, who is employed at Lin’s Marketplace, the store sells more turkeys than any other types of meat this time of year, with prime rib roast coming in second. Cedar City resident Debbie Simmons is one that celebrates the holiday with a traditional meal, and she said she enjoys cooking it. For Simmons, the turkey and all its fixin’s brings back memories of her own childhood, memories she wants to create for her own children. “When I cook Thanksgiving it takes me back to when I was a kid and I hope that my own kids will carry on those same traditions with their own family,” she said. Adults aren’t the only ones who look forward to the traditional Thanksgiving dinner. Many children also love the taste of the poultry and they look forward to the smell of turkey cooking in the kitchen all day while they play video games in the next room waiting for dinner to be done. This is true for Gabe Barnhurst, who said the turkey is his favorite part of the meal. He said he also looks forward to the stew his mom, Jennifer, makes with the leftovers. Preheat oven to 375 F. Grease a 2-quart casserole baking dish with butter, Crisco, or nonstick spray. In a medium saucepan, bring water to a boil. Slowly stir in cornmeal and season salt. Reduce heat to low and cook 2-5 minutes, until very thick, stirring constantly. Remove from heat; stir in buttermilk and mix completely. Let sit for 5 minutes. Gradually beat in the melted butter, baking powder and egg yolks. In a small bowl, beat egg whites until stiff but not dry. Fold into the cornmeal mixture. Pour batter into greased casserole baking dish. Bake at 375 F for 40-50 minutes, or until golden brown. 4-6 hours total cooking time. Place apples in a crockpot. Add all the other ingredients and mix well. Cover and cook on high for 1 hour. Using a hand masher or a fork, mash up apples. Cover and cook on low for 3-5 hours, stirring occasionally. Remove from heat and either use a wand emulsifier or blender to remove all lumps from the butter. If using a blender, make sure to not overfill with hot apple butter. Serve warm or cold. Will keep in the refrigerator for up to a month. Cook undrained corn on stovetop until hot. Add cheese packet and 2 tablespoons of butter. Mix thoroughly until blended. Drizzle in a tiny bit of milk until smooth. Do not add the amount of milk directed on the box of macaroni and cheese; it will be way too much and water down the cheese sauce. Peel potatoes and dice them into about 1-inch cubes. Add to pot. Add chicken broth to pot, just enough to submerge the potatoes until they start to float. Boil potatoes until most of the liquid is gone. At the same time: Peel and remove seeds from butternut squash. Dice into about 1-inch cubes. Boil in pot of water until they are soft. Dump everything into a large bowl. Add stick of butter and 1/4 cup brown sugar. Mix with beaters until mashed potatoes consistency. Add salt and pepper to taste. Mix again until done blending. Garnish with pad of butter on top in the middle and the remaining 1/4 cup of brown sugar sprinkled over the top. Trim some of the fat off the leg of lamb. 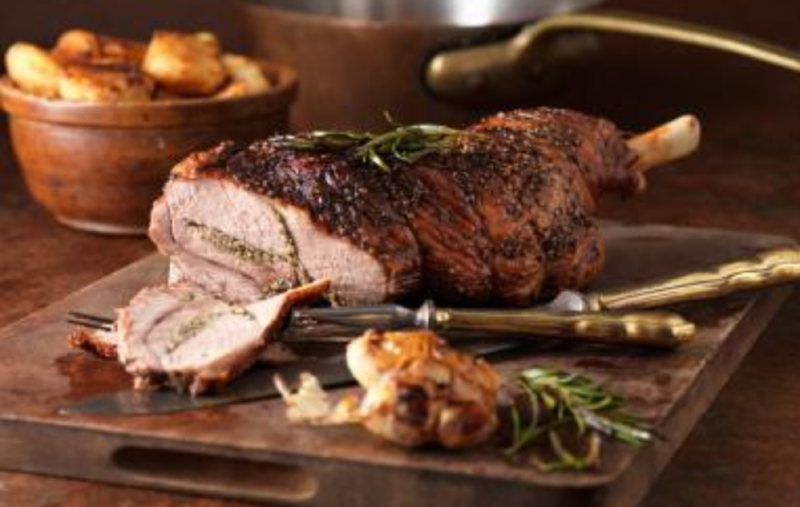 Cut slits in the top of the leg of lamb every 4 or 5 inches, deep enough to push slices of garlic down into the meat. Salt and pepper generously all over the top. Put in large roasting pan. Roast in oven 350 F until desired doneness. Don’t overcook the lamb, the flavor is best if meat is still slightly pink. Takes about 2 hours for a 5-pound leg. McIntyre’s family motto: The only thing better than meat and potatoes is meat and meat! Preheat oven to 375 F. Rub salt, pepper and paprika into the skin of the duck. Place in a roasting pan. Roast duck in preheated oven for 1 hour. Spoon 1/4 cup melted butter over bird, and continue cooking for 45 more minutes. Spoon remaining 1/4 cup melted butter over duck, and cook for 15 more minutes, or until golden brown. 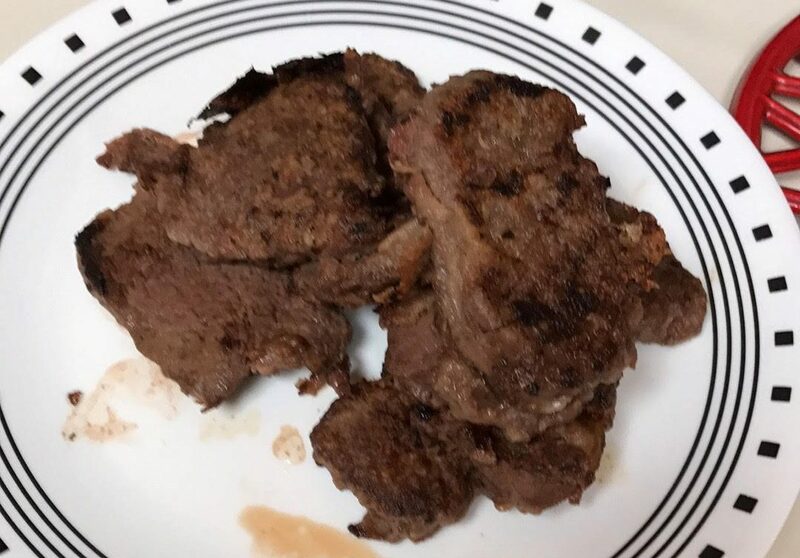 Cut the steak into bite-size pieces. Coat the pieces of steak with flour and seasoning. Heat oil in a frying pan. Cook on medium-high until done.